[177 Pages Report] The Global Masterbatch Market was valued at 9.95 Billion in 2016 and is projected to reach 13.41 Billion by 2022, at a CAGR of 5.1% from 2017 to 2022. In this report, 2016 is considered the base year and the forecast period is from 2017 to 2022. The Asia-Pacific is the fastest-growing market for masterbatch due to the high production and consumption of masterbatch in plastics in this region. Increase in infrastructure construction activities and the replacement of conventional materials such as metal with lightweight plastics are factors driving the growth of the masterbatch market. Key manufacturers of masterbatch include Clariant AG (Switzerland), A. Schulman Inc. (U.S.), PolyOne Corporation (U.S.), Ampacet Corporation (U.S.), Penn Color, Inc. (U.S.), Plastiblends India Ltd. (India), Tosaf Group (Israel), Hubron (International) Ltd. (U.K.), Cabot Corporation (U.S.), and Plastika Kritis S.A. (Greece). This report categorizes the global masterbatch market on the basis of type, polymer, application, and region. 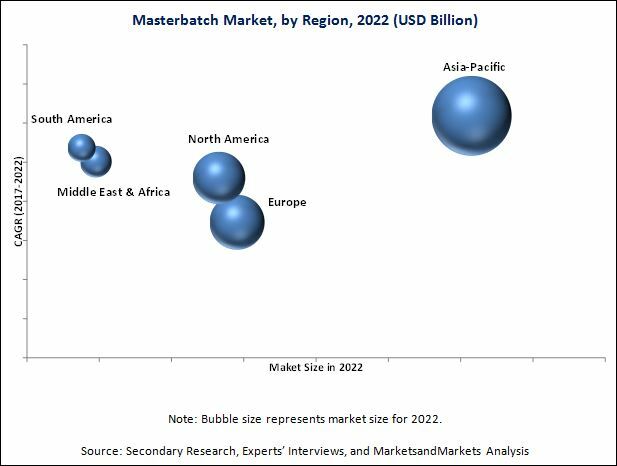 The global masterbatch market was valued at USD 10.45 Billion in 2017, and is projected to reach USD 13.41 Billion by 2022, at a CAGR of 5.1% during the forecast period. The replacement of metals by plastics in the automotive application and widely preferred coloring method are factors anticipated to drive the growth of the global masterbatch market. On the basis of type, the global masterbatch market has been classified into color, additive, white, black, and filler. The color segment is expected to lead the global masterbatch market during the forecast period, followed by the white segment. The color segment is anticipated to grow at the highest CAGR between 2017 and 2022, owing to the increasing usage of coloring in packaging, building & construction, automotive, consumer goods, textile, agriculture, and others applications. Based on polymer, the global masterbatch market has been segmented into PP, LDPE & LLDPE, HDPE, PET, PVC, PUR, PS and others. The LDPE & LLDPE segment is expected to be the fastest-growing polymer segment, as it offers greater efficiency, smoothness, and dispersion properties to the end-use applications of plastic goods. 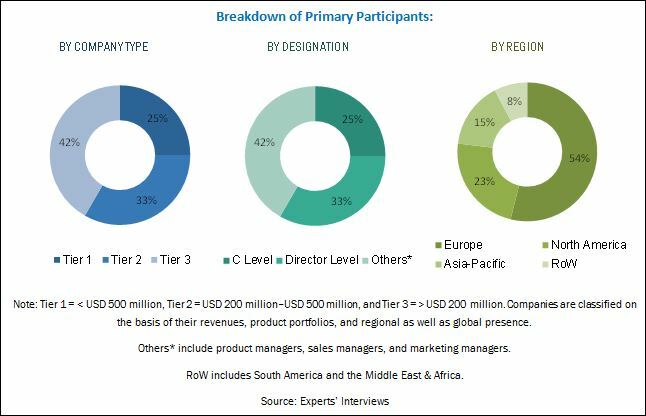 Based on application, the global masterbatch market has been segmented into packaging, building & construction, automotive, consumer goods, textile, agriculture, and others. The packaging segment is the largest application segment of the global masterbatch market. Masterbatch is used in the packaging application for goods utilized at the retail, industrial, and institutional levels. On the basis of region, the global masterbatch market has been classified into Asia-Pacific, Europe, North America, the Middle East & Africa, and South America. The Asia-Pacific region is the largest market for masterbatch. Rapid industrialization and improved living standards are factors expected to drive the demand for masterbatch in this region. In addition, the increasing applicability of masterbatch in the packaging application is further expected to drive the growth of the Asia-Pacific masterbatch market. One of the major factors restraining the growth of the global masterbatch market is the low quality and cheaper product offerings in emerging markets, which impacts the quality of masterbatch. Some of the key players operating in the global masterbatch market include Clariant AG (Switzerland), A. Schulman Inc. (U.S.), PolyOne Corporation (U.S.), Ampacet Corporation (U.S.), Penn Color, Inc. (U.S.), Plastiblends India Ltd. (India), Tosaf Group (Israel), Hubron (International) Ltd. (U.K.), Cabot Corporation (U.S.), and Plastika Kritis S.A. (Greece), among others. 11.11.7 Astra Polymers Compounding Co. Ltd.
11.11.8 Changzhou Pulaike Hongmei Masterbatch Co., Ltd.
11.11.10 Dainichiseika Color & Chemicals Mfg. Co., Ltd.
11.11.15 Meilian Chemical Co., Ltd.